I hate spiders. 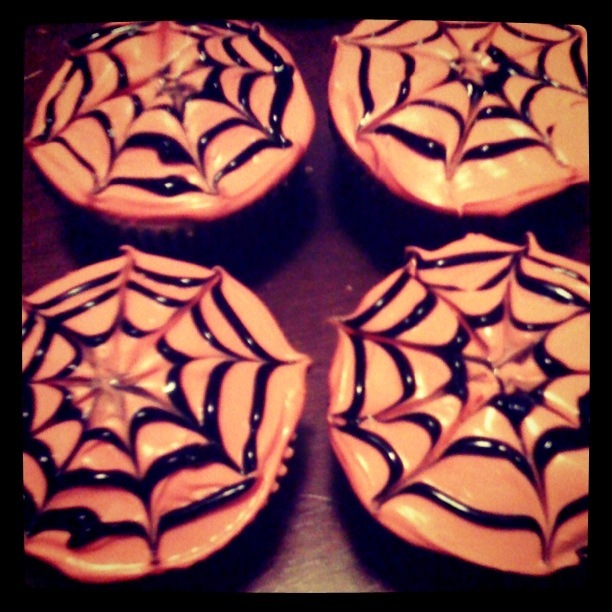 I hate them so much, in fact, that I won’t even put fake ones on the spiderweb cupcakes I made for a Halloween party. I know, it’s a little much, right? It all began when I was about four years old. My family decided to go to our local mall, and that day happened to be during the grand opening of Petland. I remember being excited to see the puppies, the kittens, and the hamsters. My Dad picked me up and carried me on his hip, and we walked toward the back of the store to look at the reptiles and fish. Little did I know what we’d find back there, and how it would affect my life! I remember being so content, amazed by the animals all in one place, safe by my Dad’s side. I then saw something out of the corner of my eye, and turned my head. I came eye to, er, eyes with a tarantula that was on the shoulder of a worker. I screamed, jumped from my father’s grasp, and ran into the middle of the mall, crying like I had been attacked. Thus began my fear, ultimate distrust, and (sometimes) hatred of spiders. Things have gotten better, and most spiders I see I try to avoid. The spiders and I have reached an agreement-as long as they stay hidden, I’ll pretend they aren’t there. If I see one outside, it can live…as long as it leaves me alone. Then again, if my cats happen to find and eat one, they get an additional treat from me afterward. And, uh…I still won’t put them on my cupcakes. If you’d like to make the design on these cupcakes for a party of your own, it’s very simple. Bake your cupcakes by following the directions on the box. Let them cool, and then frost with icing that has been dyed orange by using a mixture of a few drops of the red and the yellow food coloring. To make the spiderweb design, make three circles with the gel frosting. Start with the largest circle on the outside and move inward. Use the tip of a toothpick by placing it in the center of the cupcake, and pull it outward. Do this all the way around the cupcake, and you’ll begin to see the spiderweb design.